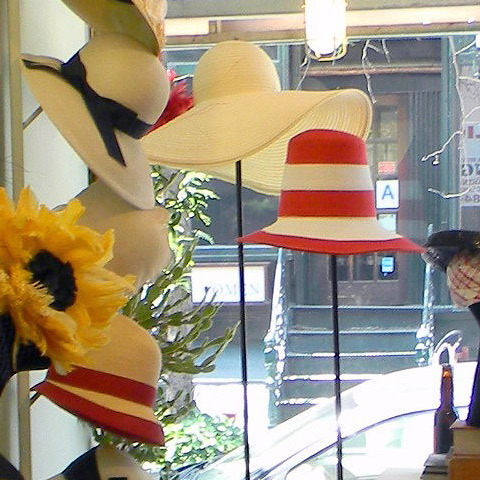 Since 1995, The Hat Shop in SoHo has been focused on New York millinery and bringing the designs of 40 local milliners into its flagship store. The true draw is that each hat is available off the rack or made to order to ensure a perfect fit, because there is no such thing as one size fits all in the millinery trade. Almost every week you will find a new style among the approximately 200 hats that are already on display. Popular styles include the boater, which is great for the summer; the Mrs. Peel, which can go from casual to the races in the flip of a brim; and the two-cornered Napoleonic bicorn style. At The Hat Shop you will also find styles fit for a wedding or for an upcoming vacation. Unique to the boutique is that The Hat Shop also carries its own, in-house line called Chapeau Chateau. Feel free to pop in and enjoy trying on all of the beautifully crafted, handmade designs, while also receiving personalized attention from the knowledgeable staff. Hats are packaged in a shiny black box that were made locally in Brooklyn, New York.